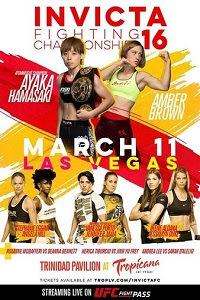 Invicta FC 16: Hamasaki vs. Brown took place on March 11, 2016 at Trindad Pavilion at Tropicana Las Vegas in Las Vegas, Nevada. Click the stars to rate how good you think Invicta FC 16 was. • Vanessa Porto vs. Jennifer Maia (Interim Flyweight Championship): Jennifer Maia def. Vanessa Porto via unanimous decision (49-46, 48-47, 48-47). • Stephanie Eggink vs. Angela Hill: Angela Hill def. Stephanie Eggink via TKO (punches) at 2:36 of Round 2. • Irene Aldana vs. Jessamyn Duke: Irene Aldana def. Jessamyn Duke via TKO (punches) at 3:08 of Round 1. • DeAnna Bennett vs. Roxanne Modafferi: Roxanne Modafferi def. DeAnna Bennett via split decision (29-28, 28-29, 29-28). • Jinh Yu Frey vs. Herica Tiburcio: Jinh Yu Frey def. Herica Tiburcio via unanimous decision (30-27, 30-27, 29-28). • Sarah D'Alelio vs. Andrea Lee: Sarah D’Alelio def. Andrea Lee via submission (rear-naked choke) at 4:21 of Round 3. • Aspen Ladd vs. Kelly McGill: Aspen Ladd defeats Kelly McGill by TKO (Elbows & Punches) at 1:47 of round 3. • Sarah Click vs. Ashley Greenway: Ashley Greenway def. Sarah Click via unanimous decision (30-26, 29-28, 29-28).